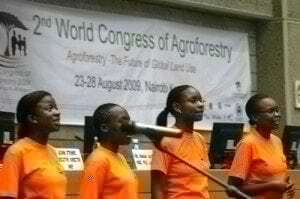 Highlighting the potential of agroforestry as a low cost, low tech means of addressing some of humanity’s most serious and vexing problems, the 2nd World Agroforestry Congress opened at the UN Complex in Nairobi, Kenya August 24. Industrialized world governments are throwing billions of taxpayer and debt-financed dollars to subsidize public-private sector development of methods to capture and store CO2 from coal plants and oil refineries. In stark contrast, a comparatively minuscule amount is being devoted to funding agroforestry R&D programs that have the potential to lift millions out of poverty while at the same time spurring large-scale efforts to mitigate and adapt to climate change and conserve natural resources and biodiversity. From nations all around the African continent and on across the Atlantic Ocean in Central and South America, participants are relating the results of agroforestry efforts to date at the Congress, many of them funded and supported wholly or in part by the UN Consultative Group on International Agricultural Research (CGIAR) and The World Agroforestry Centre. Besides offering a means of capturing and storing carbon on a large-scale, these projects stand out in terms of their equally beneficial “ancillary” effects– improving the ability of communities and supporting ecosystems to adapt to climate change, helping withstand droughts and/or floods, conserving soil, empowering women and providing critical supplemental income to small subsistence farmers, families and communities among them. One example is the large number of small landholder farmers in southern and eastern Africa that have been planting “fodder” shrubs and “fertilizer” trees as part of a World Agroforestry Centre R&D and outreach project. Fertilizer trees planted on maize farms in Malawi and Zambia are now adding essential nutrients to these soils and reducing farmers’ need to buy inorganic nitrogen-based fertilizers. The net effect: Yields are up the equivalent of 54-114 additional person-days of maize consumption–that’s 2-3 months’ worth for a typical household, according to the Centre. Another very successful, low cost and low tech effort involves planting of “fodder” shrubs by nearly 250,000 small landholder farmers that have joined more than 224 organizations in Kenya, Rwanda, northern Tanzania and Uganda. Doing so has resulted in dramatic increases in milk production and added about $122 a year to household incomes. The latter is enough for parents to be able to pay school fees for their children, buy other farm inputs, build better houses and meet other domestic needs. It’s also empowering women in these areas, which, though a good thing, is also causing some social adjustment problems, according to the WAFC. “We can empower people – not to wait for others to do something for them – but to take the initiative, one tree at a time. Trees are one of nature’s most ingenious answers to many of our problems,” UN undersecretary general and United Nations Environment Programme executive director Achim Steiner stated in an opening day speech at the Congress.